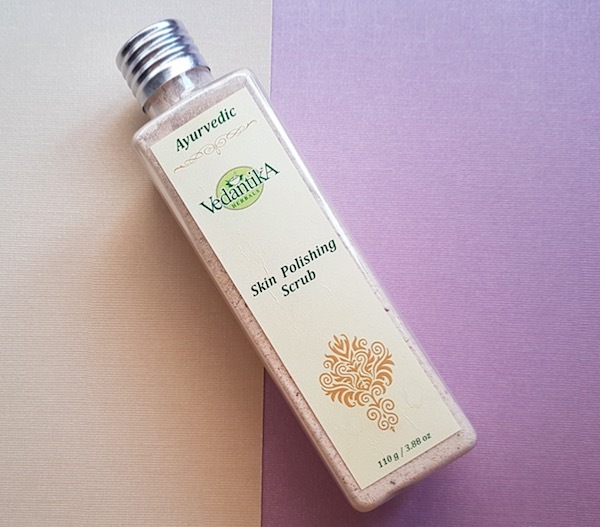 Hello everyone, today I’m reviewing Vedantika Skin Polishing scrub that I have been using for the past one month. Vedantika Herbals is an Indian Ayurvedic brand that offers a wide range of skincare, haircare and healthcare products. They use 100% natural and chemical free ingredients to make their products. Do check out their website vedantikaherbals.com to know more about their product range. 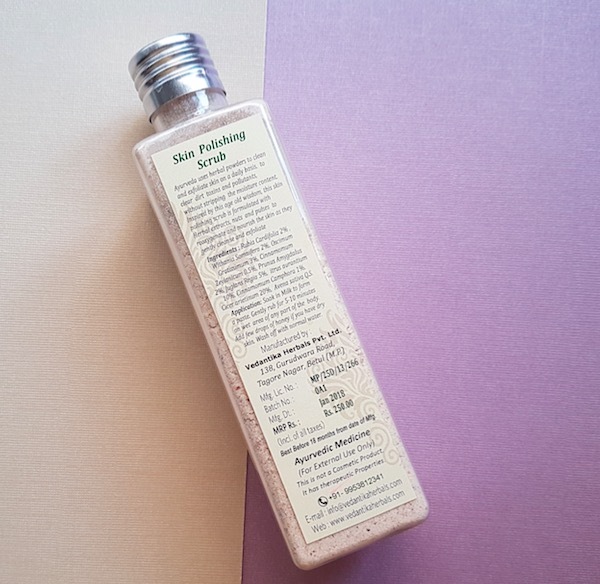 Packaging: The skin polishing scrub comes in a transparent, plastic bottle with screw cap. An additional plastic lid is also provided to keep the powder moisture free and fresh. The product related information like the ingredients, price, benefits, how to use, expiry date, etc. is also mentioned on the bottle. 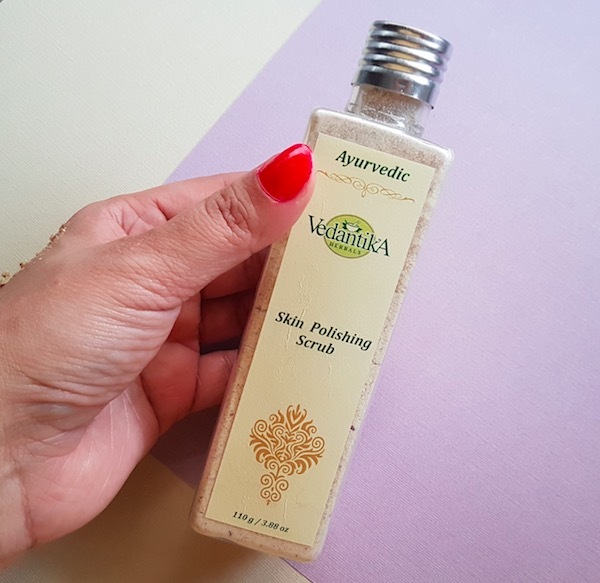 Price & Availability: The cost of the Vedantika Herbals Skin Polishing Scrub is Rs.150 for 50g sachet and Rs.250 for a 110g bottle. Vedantika Herbals products can be bought online from Nykaa.com and Amazon.in. You can also purchase products from their official website here. 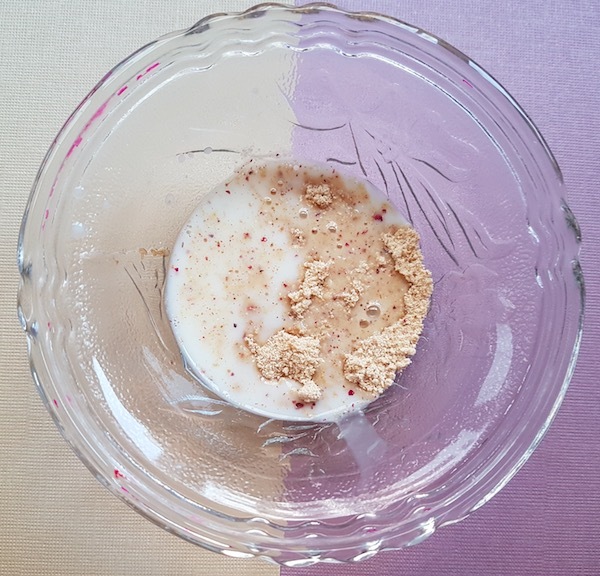 Take one teaspoon of the powder mix in a glass bowl (this quantity is sufficient for face and neck). Add enough raw milk to form a paste and let it rest for 2-3 minutes. (You can add a few drops of honey or olive/jojoba oil if you have dehydrated skin). Start gently massaging the scrub on damp face and neck in a circular motion using fingertips for about 5-10 minutes. (Avoid rubbing the scrub on the lips and the area around the eyes as it can irritate). Rinse the face nicely with plenty of tap water. Pat dry the skin and apply a good moisturizer. 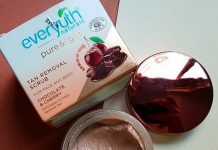 My Experience: This skin polishing scrub comes in an off-white colour and powder form with a few brown granules. It has a strong camphor scent that you can smell even before opening the cap. The texture of the scrub is almost like a chickpea flour or grounded oatmeal. 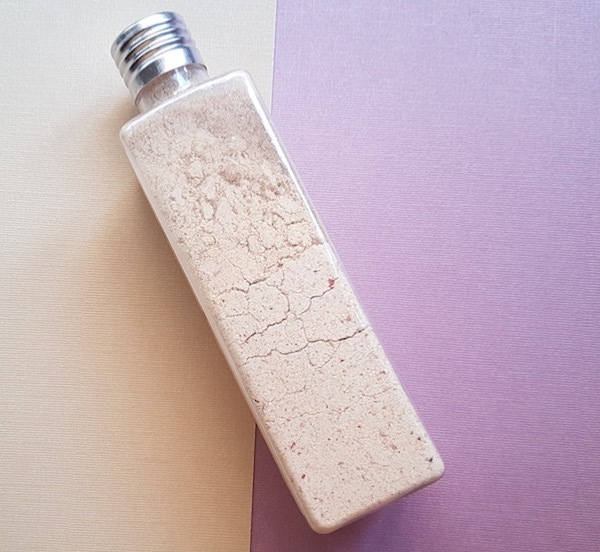 The scrubbing granules are very gentle on the skin and exfoliate dead skin cells leaving the skin soft, refreshed, and deeply cleansed. It does give a cold tingling sensation on the skin, and you can also feel a little irritation, but that doesn’t last long. The one thing that I liked most about this scrub is its calming sensation. It helps in calming the muscles and gives very relaxing and refreshing feel. As I’ve shared earlier, I have been using it for the past one month, twice a week. 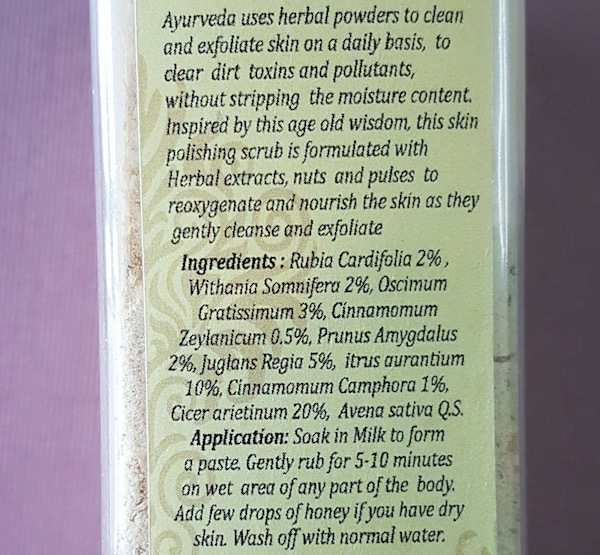 It is a mild scrub and doesn’t extract whiteheads or blackheads. But it does work on reducing skin pigmentation and tanning, when used regularly (2-3 times a week) for 2-3 months. My feet and hands got very tanned and dull earlier, and it did help in removing tan from them. It is made with 100% natural ingredients and is free from harmful chemicals. It exfoliated dead skin cells leaving the skin soft, supple and refreshed. Its aroma helps in relaxing the tired mind and body. 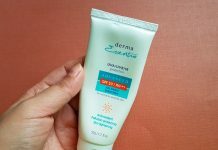 It didn’t cause any allergy or irritation to my acne prone oily skin. 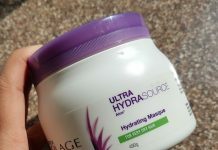 It helped in reducing tan from my feet and hands. 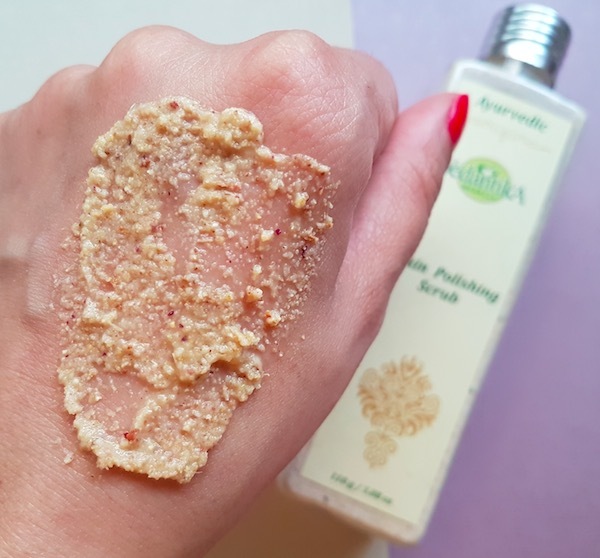 You can use this skin polishing scrub on the whole body including the face. Suitable to use for all skin types. It can be used by men as well. I found it value for money as the quantity provided for its price is pretty generous. It has a strong camphor scent that might irritate people who are sensitive to strong fragrances. It is a very gentle scrub that is not effective in removing blackheads or whiteheads. It gives mild tingling sensation and skin also turns a little red sometimes after using it. So those who are allergic to natural ingredients or have sensitive skin should avoid it. 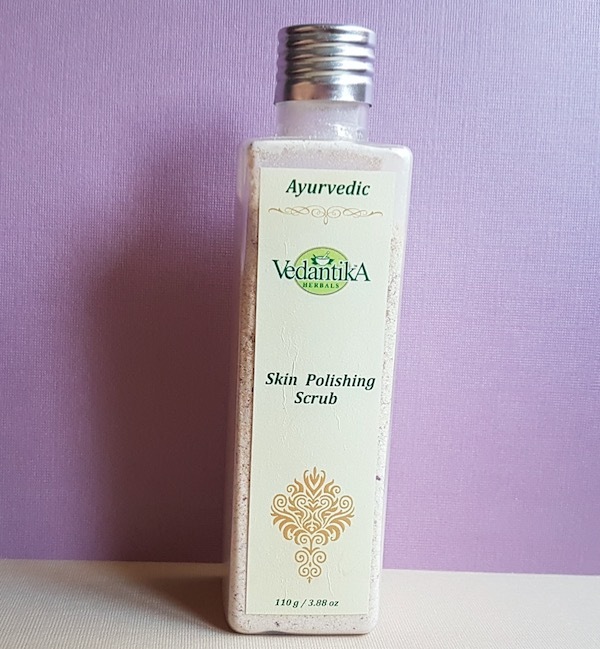 Overall, I liked this skin polishing scrub from Vedantika Herbals. It gently exfoliates dead skin, leaves the skin soft, nourished and also helps in reducing tan. Additionally, I found its aroma very calming and relaxing. I will recommend buying this scrub to those who want to have a relaxing Spa like experience at home. However, those who are sensitive to camphor scent can skip it.